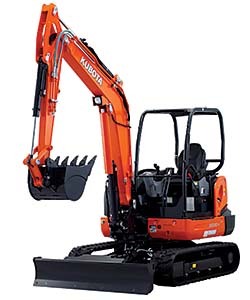 The KXO40-4's hydraulic 6-in-1 blade enables six different positions: left end up, right end up, left end forward, right end forward, raised, and lowered. By moving the dozer lever, operators can angle the blade right or left to push soil aside while the machine moves forward. The operator can command all six functions simultaneously for more convenient landscaping, shaping and backfilling control. The blade is 5 feet, 10.9 inches wide and stretches across the machine's width.